This history of Melton Mowbray was written by Patrick McCollum for Melton On Line. Click on any of the chapters below – or simply follow the links at the bottom of each page to read it in sequence. A view of Burrough on the Hill Iron Age fort. The ‘Welby Hoard’ (now in Leicester Museum) gives evidence for human activity in the Melton area at the time of the Bronze Age (circa 600 B.C. ), while the Iron-Age hill fort at Burrough Hill (5 miles South of Melton) is clear evidence of the substantial presence of ancient Britons prior to the Roman occupation of Britain (photo above). 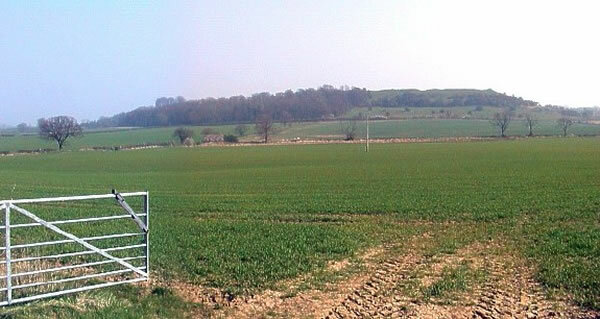 There is no evidence of a Roman settlement in Melton, but only of their passage through the area – the Fosse Way passing nearby (along the line of Six Hills Lane) with many other Roman tracks interlinking the area. Roman settlements have been found at Bottesford, Belvoir and Goadby Marwood. The earliest proof of occupation within Melton Parish dates only to Anglo Saxon times. The “-by” endings to many of the settlements in the area is evidence that Dane law prevailed locally for a time.